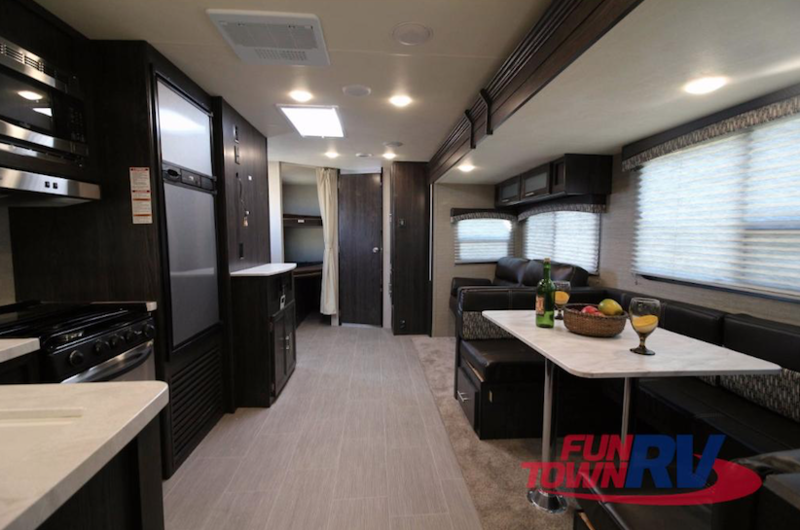 One of the reasons we’re proud to be your Dutchmen Kodiak dealer is because of the fact that these travel trailers were designed to meet the needs of families of all sizes. And, despite all of the space you’ll find in these RVs, you can rest confident that they’re lightweight and affordable. Read our Dutchmen Kodiak Ultra Lite 285BHSL review to learn more. Enjoy the perks of having a wonderful kitchen wherever you go in the Kodiak Ultra Lite. From reheating a quick frozen pizza to creating a delicious meal made from local favorites, you will love cooking in this kitchen and dining in the cozy u-shaped dinette booth. Three-Burner Range Top with Oven – make side dishes while the main course bakes! 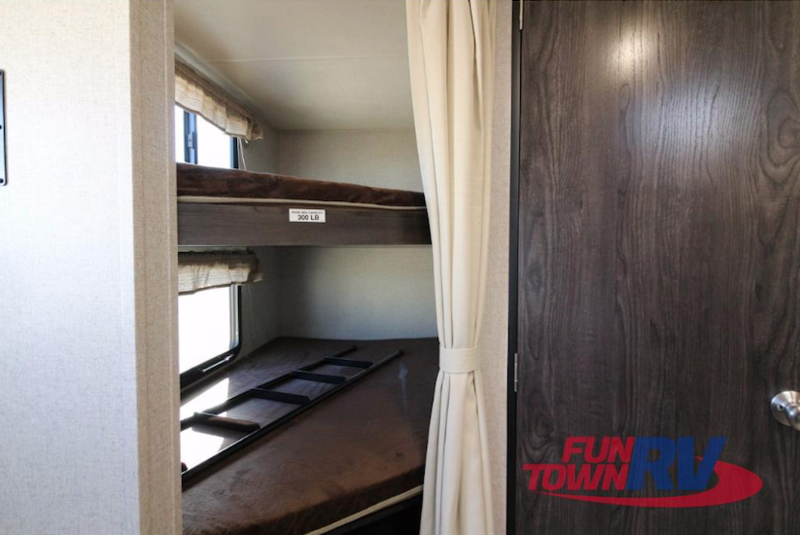 The best thing about the bunkhouse Kodiak Ultra Light floorplans is that they provide the kids or guests with their own space. Privacy curtains offer a way to differentiate the space, while additional storage offers everyone a place for their stuff. You might think that because an RV is lightweight is lacks in features. This couldn’t be further from the truth. 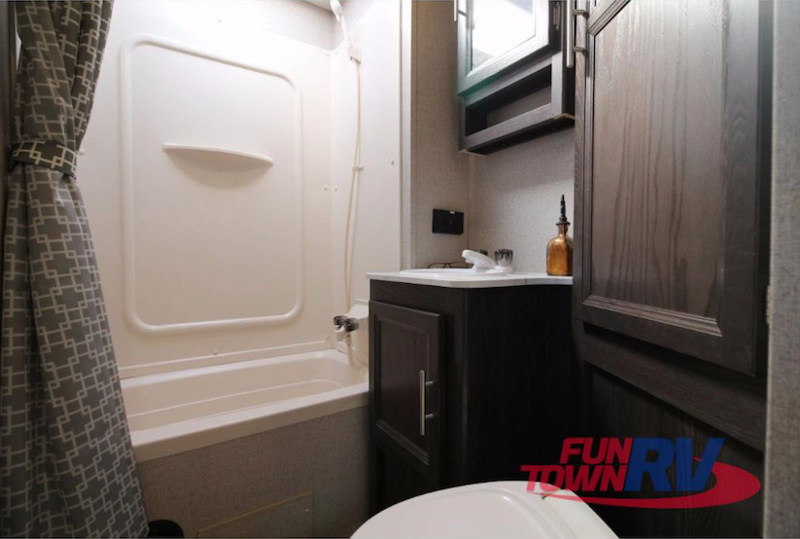 In fact, one look at the Kodiak Ultra Lite’s bathroom and you’ll see what we mean. This feature rich space was designed to be comfortable, practical, and inviting. If you’re interested in learning more about our selection of Dutchmen Kodiak travel trailers for sale, contact us. We can answer any questions you have and make sure you get the information needed to make the right decision for your family. From RV financing to parts and service, we’re here for you before, during, and after the sale.